Walgreens is leading the fight against prescription drug abuse with new programs to help curb the misuse of medications and reduce the rise in overdose deaths. 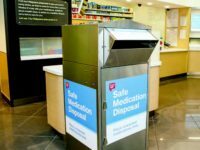 In the first ongoing national effort by a retailer, Walgreens has installed safe medication disposal kiosks in over 600 pharmacies across 45 states. Walgreens kiosks provide a safe and convenient way to dispose of unwanted, unused, or expired medications at no cost, year-round. Kiosks are available during regular pharmacy hours and offer one of the best ways to ensure that medications are not accidentally used or intentionally misused by someone else. The types of medications accepted include prescription and over-the-counter drugs, ointments and creams, liquids, lotions, pet medications, and vitamins. Certain medications are not accepted at the kiosks, such as hydrogen peroxide, needles, inhalers, aerosol cans, thermometers, and illegal drugs. Here’s how it works. Used sharps, such as needles and lancets, are not accepted at Walgreens. However, some communitites do offer a program to collect sharps. Check the kiosk locator to see if there is a Walgreens location near you. If you don’t live near a Walgreens safe disposal kiosk, or for other questions about safe medication disposal, call your local solid waste management department to ask where and how to dispose of unwanted medications in your community.